Sony has announced that it has expanded its Vita handheld brand into the living room, with the launch of PlayStation Vita TV. Announced at the Tokyo Game Show, the PS Vita TV is a mini box that is compatible with PS Vita cards, which means you can play your PS Vita games on the big screen. The PS Vita TV box also houses the ability to stream PS4 content - essentially expanding your PlayStation 4 gaming experience into a multi-room experience. The box will also be compatible with PS controllers. 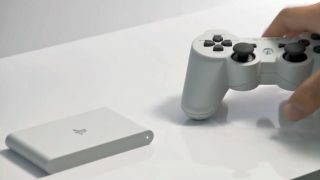 There has been a rise in tiny consoles coming though Kickstarter using Android as an OS - Ouya and the like - so Sony offering Vita-quality gaming at a low price is definitely a shrewd move by the company. It is also a move that tries to quash the slow rise of Apple TV. The PS Vita TV will offer access to iTunes rivalling Music Unlimited and Video Unlimited and there will also be a Karaoke mode. The mini console has been priced at an achingly low 10,000 yen, which is around £65 / $100. If you want one bundled with a controller and storage, then the price rises to £96 / $150. The Sony PS Vita TV release date is 14 November but there is no word if this is Japan only at the moment.